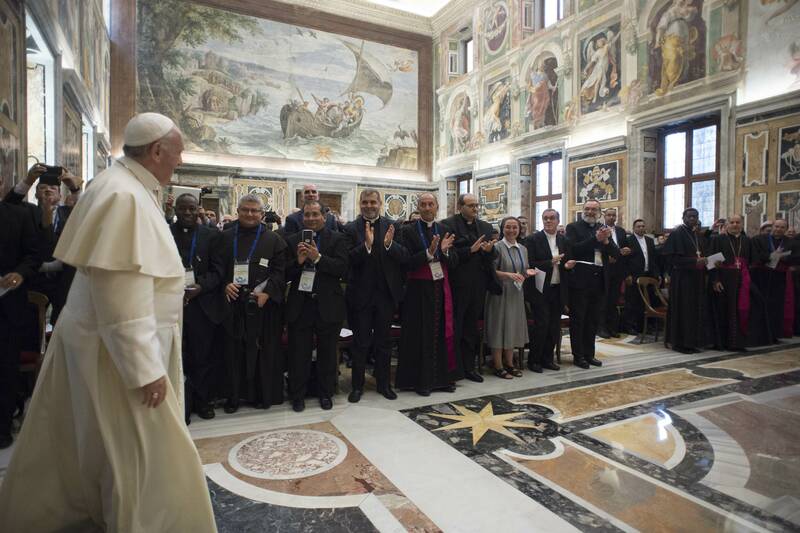 On June 1m 2018, in the Clementine Hall of the Vatican Apostolic Palace, the Holy Father Francis received in audience the National Directors of the Pontifical Missionary Societies, on the occasion of the annual General Assembly which takes place from 28 May to 2 June at the Fraterna Domus of Sacrofano. I welcome you with joy on the occasion of your General Assembly and I greet you all cordially. I thank Cardinal Filoni for his introductory words, and I greet the new President of the Pontifical Mission Societies, Msgr. Giampietro Dal Toso, who for the first time takes part in this annual meeting of yours. I express to you all a lively sense of gratitude for your work in raising missionary awareness among the People of God and I assure you of my remembrance in prayer. We have an interesting journey ahead: the preparation of the Extraordinary Missionary Month of October 2019, which I announced on the last World Mission Day of 2017. I strongly encourage you to live this phase of preparation as a great opportunity to renew the missionary commitment of the whole Church. It is also a providential occasion to renew our Pontifical Mission Societies. Things must always be renewed: renew the heart, renew the works, renew organizations, because otherwise, we would all end up in a museum. We must be renewed so as not to end up in the museum. You are well aware of my concern at the danger that your work will be reduced to the mere monetary dimension of material aid – this is a real concern – turning you into an agency like many others, even though of Christian inspiration. This is certainly not what the founders of the Pontifical Mission Societies and Pope Pius XI wanted when they were established and organized in the service of the Successor of Peter. For this reason, I have proposed again as a current and urgent renewal of the missionary awareness of the whole Church today, a great and courageous intuition of Pope Benedict XV, contained in his Apostolic Letter Maximum illud: that is, the need to evangelically renew the Church’s mission in the world. This common goal can and must help the Pontifical Mission Societies to live a communion of spirit, reciprocal collaboration, and mutual support. If renewal is to be authentic, creative and effective, the reform of your Societies will consist of a re-foundation, a redevelopment according to the needs of the Gospel. It is not simply a matter of rethinking the motivations to do better what you already do. The missionary conversion of the structures of the Church (cf. Apostolic Exhortation Evangelii Gaudium, 27) requires personal holiness and spiritual creativity. So not only to renew the old but to allow the Holy Spirit to create the new. Not us: the Holy Spirit. Make room for the Holy Spirit, allow the Holy Spirit to create the new, make all things new (see Psalm104: 30, Mt 9: 17, 2 Pt 3: 13, Rev 21: 5). He is the protagonist of the mission: He is the “office head” of the Pontifical Mission Societies. It is He, not us. Do not be afraid of the newness that comes from the Crucified and Risen Lord: these changes are beautiful. Be afraid of other novelties: these do not go! Those that do not come from there. Be bold and courageous in the mission, collaborating with the Holy Spirit, always in communion with Christ’s Church (cf. Apostolic Exhortation Gaudete et exsultate, 131). And this boldness means going with courage, with the fervor of the first who proclaimed the Gospel. Your habitual book of prayer and meditation is the Acts of the Apostles. Go there to find inspiration. And the protagonist of that book is the Holy Spirit. What does it mean for you, the Pontifical Mission Societies, who, together with the Congregation for the Evangelization of Peoples are preparing the Extraordinary Missionary Month, to re-qualify oneself evangelically? I believe it simply means a missionary conversion. We need to re-qualify – the intuition of Benedict XV – to redevelop ourselves starting from the mission of Jesus, to re-qualify in the effort to collect and distribute material aid in the light of the mission and formation that it requires, so that conscience, awareness and missionary responsibility become once again part of the ordinary experience of the whole holy faithful People of God. “Baptized and sent out: the Church of Christ on a mission in the world”. This is the theme we have chosen for the Missionary Month of October 2019. It emphasizes that being sent on mission is a call inherent in Baptism and is for all the baptized. So the mission is sending for salvation that performs the conversion of the envoy and of the recipient works: our life is, in Christ, a mission! We ourselves are mission because we are God’s love communicated, we are God’s holiness created in His image. The mission is, therefore, our own sanctification and that of the whole world, ever since creation (cf. Eph 1: 3-6). The missionary dimension of our Baptism thus translates into a witness of holiness that gives life and beauty to the world. Renewing the Pontifical Mission Societies means, therefore, to take to heart, with serious and courageous commitment, the sanctity of each person and of the Church as a family and a community. I ask you to renew with creativity the nature and action of the Pontifical Mission Societies, placing them at the service of the mission, so that at the heart of our concerns there may be the holiness of the life of missionary disciples. Indeed, in order to collaborate in the salvation of the world, we need to love it (cf. Jn 3:16) and be willing to give life by serving Christ, the sole Saviour of the world. We do not have a product to sell – it has nothing to do with proselytism, we do not have a product to sell – but a life to communicate: God, His divine life, His merciful love, His holiness! And it is the Holy Spirit who sends us, accompanies us, inspires us: He is the author of mission. It is He brings forward the Church, not us. Not even the institution of the Pontifical Mission Societies. Do I leave it to Him – we can ask ourselves – do I leave him to be the protagonist? Or do I want to tame it, cage it, in the many worldly structures that, in the end, lead us to conceive the Pontifical Mission Societies as a firm, a business, a thing of our own, but with God’s blessing? No, this is not right. We have to ask ourselves this question: do I leave it to Him or the cage? He, the Holy Spirit, does everything; we are merely His servants. As you well know, during October 2019, Extraordinary Missionary Month, we will hold the Synod for Amazonia. Welcoming the concerns of many faithful, laity and pastors, I wanted to meet to pray and reflect on the challenges of evangelization of these South American lands where important particular Churches live. I feel that this coincidence helps us to focus our gaze on Jesus Christ in dealing with problems, challenges, riches, and poverty; it helps us to renew our commitment to serving the Gospel for the salvation of the men and women who live in those lands. Let us pray that the Synod for the Amazonia may evangelically renew the mission in this region of the world that is so tried, unjustly exploited and in need of the salvation of Jesus. Mary, when she went to Elizabeth, did not do it as a gesture, as a missionary. She went as a servant of the Lord she carried in her womb: she did not say anything about herself, she merely brought the Son and praised God. One thing is true: she went in a hurry. She teaches us this faithful haste, this spirituality of haste. The haste of fidelity and adoration. She was not the protagonist, but the servant of the sole protagonist of the mission. And may this image help us. Thank you!